Studio portrait of Australian Prisoner of War (POW) 3188 Private (Pte) Herbert Sampson Tharme, 55th Battalion, from Leichhardt, NSW. Pte Tharme enlisted on 12 August 1915 and embarked for overseas on 20 December 1915 aboard HMAT Suevic. He was captured at Fleurbaix, France on 20 July 1916 and held as a POW initially at Dulmen and then at Schneidemuhl. He was repatriated to London in December 1918. He was married in England on 4 September 1919 and arrived back in Australia on 10 December 1920. One of a series of over 400 photographs sent by Australian POWs in German camps to Miss M. E. Chomley, Secretary, Prisoners Department, Australian-British Red Cross Society, London. Original album housed in AWM Research Centre at RC00864, Album image number 123. Studio portrait of two Australian Prisoners of War (POW). Sitting is 3188 Private (Pte) Herbert Sampson Tharme, 55th Battalion, from Leichhardt, NSW and standing is 6049 Pte Peter Lorenzen, 15th Battalion from Rockhampton, Queensland (originally of Denmark). Pte Tharme enlisted at the age of 29 on 12 August 1915 and embarked for overseas on 20 December 1915 aboard HMAT Suevic. He was captured at Fleurbaix, France on 20 July 1916 and held as a POW until he was repatriated to London in December 1918. He was married in England on 4 September 1919 and arrived back in Australia on 10 December 1920. 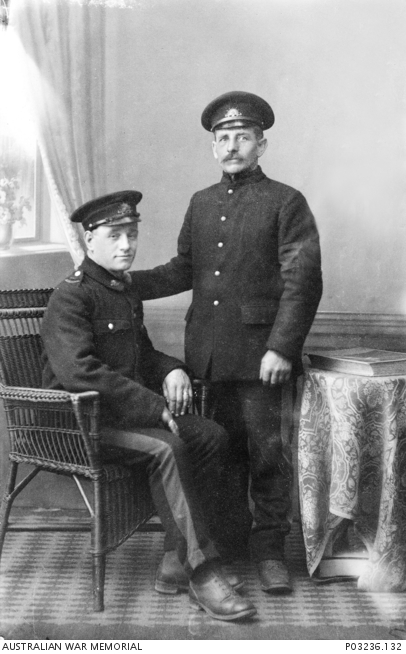 Pte Lorenzen enlisted at the age of 40 on 6 March 1916 and embarked for overseas on 8 August 1916 aboard HMAT Itonus. 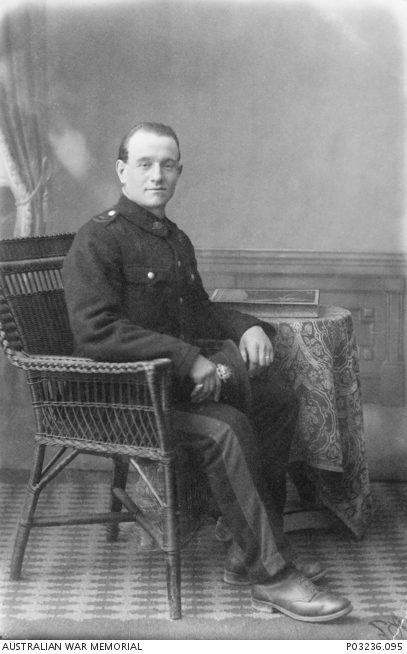 He was captured at Rennecourt, France on 11 April 1917 and held as a POW in Germany. On 1 April 1918, Pte Lorenzen wrote from POW Camp Schneidemuhl, Germany “The food parcels we are receiving at present are absolutely A.1. At present I am suffering from a poisoned finger sustained whilst at work. Pte S. Tharme has written this short note in my stead. We are both employed on the same farm.” Pte Lorenzen was repatriated to England on 1 December 1918 and arrived back in Australia on 2 June 1919. One of a series of over 400 photographs sent by Australian POWs in German camps to Miss M. E. Chomley, Secretary, Prisoners Department, Australian-British Red Cross Society, London. Original album housed in AWM Research Centre at RC00864, Album image number 160.